A great place in the artist’s work is occupied by events, the heroic victories of the Russian fleet, which occurred directly during the life of IK Aivazovsky. He had a great opportunity to talk with the participants of the sea battles, to visit the battlefields. So, in 1848, the artist painted a picture of the “Navarino battle”, which depicted an event that also glorified the Russian fleet. The Allied Allied Fleet entered the Navarino Bay, where the Turkish-Egyptian fleet was concentrated. After fruitless attempts to negotiate, after the firing of the allied fleet by Turkish ships and coastal batteries, the Battle of Navarin began in October 1827. Russian battleships, being in the center and taking the main blow of the Turkish-Egyptian forces, skillfully destroyed the bulk of the enemy fleet. The line ship “Azov” under the command of captain 1st rank MP Lazarev, fighting with five enemy, destroyed them. Aivazovsky shows the flagship “Azov” badly damaged, but the crew of the ship is boarded by a Turkish ship, and the heroic Russian sailors pass to its deck to complete the destruction of the enemy ship. 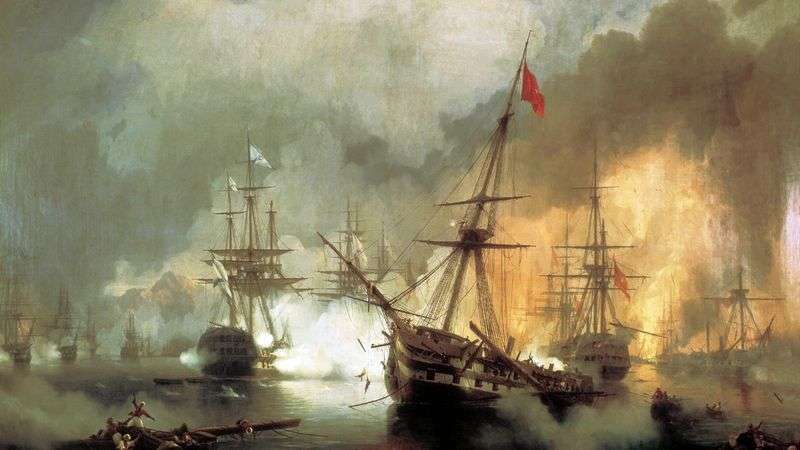 This episode – the battle of Azov with the main Turkish ship – and placed in the center of the composition of the picture “Navarino fight”. In this picture Aivazovsky by the very structure of the composition, by the skilful display of the offensive rush of the Azov ship and the doom of the Turkish ship leaves no doubt about the outcome of the battle. “In honor of the praiseworthy deeds of the chiefs, courage and fearlessness of the officers and bravery of the lower ranks, the ship Azov received the St. George flag, and the whole world admired the courage and skill of the Russian sailors. Description and meaning of the painting Naval Battle of Navarino October 2, 1827 by Ivan Aivazovsky.